All kids are different, and so are their play preferences. 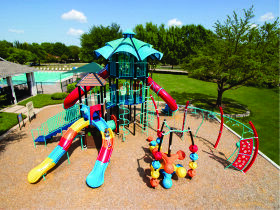 As you can see, we strive to offer the most diverse set of choices possible as you design your play area. We aim to please when it comes to different companies, different pieces, and different styles of equipment. And all of our designs are scalable to fit the size of your play space as well as your budget. By combining slides, climbers, stairs, ladders, and bridges, we can build a play area as big or as small as you like, and that appeals to the varied tastes of the kids that will be using it. Seeking a shelter is all about peace of mind, and we’ll help you make the best possible choice. First, think about which material will make you feel the most secure in your requirements. 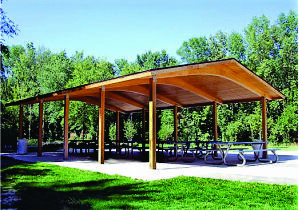 You can choose from metal and fabric, or laminated wood – even tubular steel and with panelized roof systems. And there’s plenty of diversity in the shape of your shelter. We can show you everything from pagodas to domes to amphitheaters – even tent-like sun shades. The hard part is choosing! To assist with making your site functional, you’ll still need to consider the everyday demands of the people that use it – you’ll need places to sit and relax, somewhere to safely lock up a bike - even a place for visitors to toss the remnants of their picnic lunch. You’ll find everything you need here in the links below. You should probably start with a look at seating units, because once you finish climbing all over on one of our play sets with the kids, you’re going to need a break! We have the best brand names, the greatest variety of choices, and the best designs - and each piece comes with the best warranty in the business. 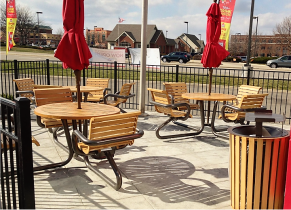 Whether you’re in the market for light, moveable seating, or solid benches and tables meant to survive a hurricane, you’ve come to the right place.